While toilet seats tend to be white or at the very most a wooden colour, this black toilet seat is the exact style you want if you like to be different, unique. Built on the design and idea of a hotel toilet seat this is the perfect place to get started and in trying to find the best toilet seat for your own property. This oval shaped toilet seat is strong enough that a bullet would bounce straight off! It’s an incredibly durable piece of equipment and ticks all of the hotel standard boxes for comfort, safety and quality so you can be sure that you are using the best toilet seat that you possibly can when you buy this Daka toilet seat. It’s got a soft close and easy open lid so that when the seat comes down there is no slamming or banging of your fingers – just comfortable and quick closing that gives you plenty of time to get your fingers out from the bottom! It’s very easy to fit and comes with all the fittings that you could possible need to fit the thing, so what more could you be looking for from your toilet seat that you bought? 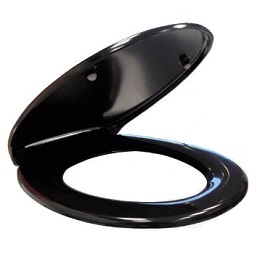 At just £28.95 this is the perfect toilet seat for somebody looking for something a different.